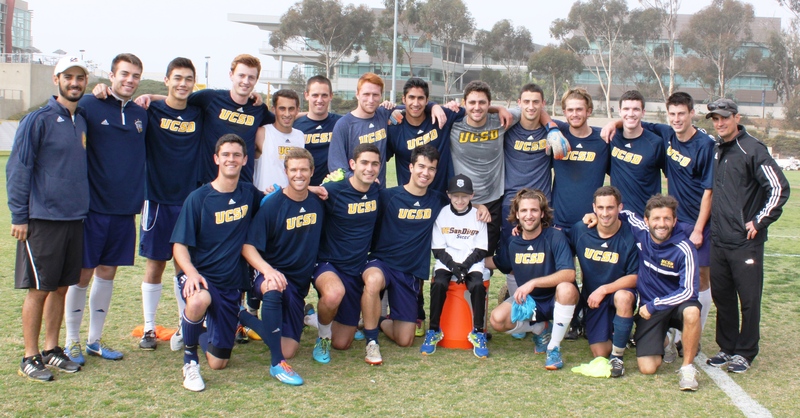 UCSD Tritons Men’s Soccer Team Adopts Travis! 1/29/2014 | Travis the Warrior --- Kickin' Cancer! On Tuesday, the UCSD Tritons Men’s Soccer Team “adopted” Travis through the Friends of Jaclyn Foundation (http://www.friendsofjaclyn.org/). The FoJ Foundation works to pair kids fighting through pediatric brain tumors with college or high school sports teams as a way to share some love, support and friendship while they battle this disease. Coach Jon Pascale, Coach Ryan Hernandez, Coach Seth Trembly and the Team invited Travis out to their practice and it was great to watch the guys working hard and having fun. Everyone was so welcoming and really made Travis feel special. We can’t wait to have some of Travis’ new extended family out to a practice or something to return the favor. Thank you guys so much…Go Tritons! That is so cool, Travis!! You can teach those guys some of your mad soccer skills. awesome meeting you on Tuesday Travis! hope to see you again soon!